A helpful checklist on how to settle a Living Trust Estate. Most of us have an estate, a legacy we leave to our families. We also have a choice over how that legacy will be passed on. If we choose to do nothing, we are choosing to allow the State to administer our estate and to determine who receives our legacy. An average probate can cost 5 to 10 percent of the gross estate. Avoid probate by creating a Living Trust. If we choose to create a Last Will and Testament, we are still choosing the State to administer our estate, but we make the decisions about who receives our legacy. Those who choose to create and fund a Living Trust do so, in part to save their families the costs, delays and hassles of probate. An average probate can cost upwards of 5 to 10 percent of the gross estate and take anywhere from 9 to 18 months to complete. If your mom or dad, for example, had a funded Living Trust, you would not have to go through probate, but you will have to handle the trust administration. While trust administration is less complicated and less expensive than probate, it can be more complicated than most people think. What are my responsibilities as a successor trustee? The person or persons listed in the trust as next in line to manage the trust when mom or dad passes away is called the successor trustee. 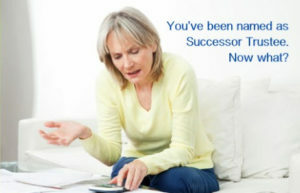 Most successor trustees use an attorney to help with trust administration. Usually the attorney then makes sure they do most of the work. It is not uncommon for an attorney to charge upwards of 1 percent of the net estate value for this service. 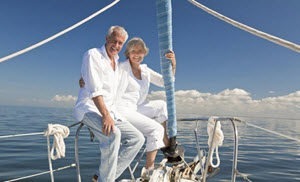 While there are some legal requirements involved in settling a Living Trust, most of the steps can be completed without undue burden by the successor trustee, saving thousands to tens of thousands of dollars for the heirs. 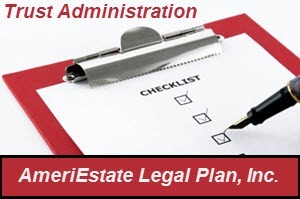 AmeriEstate offers trust administration services designed to assist successor trustees with the legal requirements and formalities for a fraction of what most attorneys charge. We also provide additional guidance and support to assist successor trustees to effectively handle most administrative tasks on their own. There is no set timetable for completing a trust administration. A typical trust administration will take at least 4 to 6 months, however circumstances such as dealing with an active business or disposing of real property could extend the administration somewhat. The successor trustee will have to do the following or coordinate with the Estate Planning attorney or similar specialized service provider, such as AmeriEstate for a typical trust administration. These tasks are specific to a trust administration in California, although most of these steps are applicable to a trust administration in any state. You should seek appropriate guidance for the state in which your parent resided and where the trust administration occurs. Make a list of your parents' assets, debts, expenses and ongoing bills. Note on your list if the assets are titled in the name of the trust or in the sole name of one or both of your parents. To accomplish this, review all statements and deeds. Order five to ten original Death Certificates from the funeral home. Find the Living Trust and the original Will. It is not critical to have the original Trust, but it is important to have the original Will (more on that later). You will need to make records of all of your expenses as trustee. This is a very important task that should not be taken lightly. As trustee, you have a fiduciary responsibility to the Trust beneficiaries. They have a legal right to look over your shoulder, and unless they waive this requirement, you will need to give them a written accounting of all Trust receipts and expenses. Most successor trustees can benefit from reviewing the Trust and Trust assets with an experienced professional. Use this time to request a detailed list of the specific tasks and to identify potential issues associated with the specific Trust. Then you can decide to what extent you wish to employ the services of a professional. Be wary of just turning the administration over to the attorney without understanding what is involved and what you can easily do on your own. You will need to get a tax identification number for the Trust from the IRS. Once your parent dies, his or her social security number can no longer be used on the accounts. The bank or financial institution will want you to give them a Trust tax identification number. Your attorney, other service provider or CPA can help ensure the application for a new tax identification number is completed correctly. The California Probate Code requires the trustee to send a notice to all Trust beneficiaries and potential heirs. The notice must comply with Probate Code Section 16061.7 and must be sent within 60 days of the date of death. Probate Code Section 8200(a) requires the custodian of the original Will to “lodge” it with the probate court within 30 days of death. “Lodge” is an old fashioned legal term for “file.” The court filing fee is $50. You will need to attach an original Death Certificate to the Will. If either (or both) of your parents was a recipient of Medicaid benefits (Medi-Cal in California), mail a notice to the California Department of Health Care Services of your parent(s) passing. This must be sent to the main department office in Sacramento, not mailed or delivered to a local branch office. You will need to include an original Death Certificate. When you provide this notice to DHCS, they will send you an estate assets questionnaire to complete and return. This is so they may lodge a claim with you for repayment of financial resources paid on your parent(s) behalf. Note that you are not required by law to complete or return this questionnaire and you may or may not be required to repay the State. You should consult an attorney for guidance if either of your parents received Medi-Cal benefits. If your mother or father owned real property, you will need to record an Affidavit of Death of Trustee with an original Death Certificate with the county recorder. This provides notice that you, as successor trustee, now have authority to sell the property or transfer it to an heir, as appropriate. This is a relatively new requirement that you would usually prepare and file along with the Affidavit of Death of Trustee. The county assessor will attempt to reassess the property value and adjust the property tax whenever there is a change in ownership – such as when a parent dies and the property is transferred to the children, However, a transfer from parent to child will not cause a reassessment if the trustee (or the attorney) submits a Claim for Reassessment Exclusion for Transfer Between Parent and Child to the county assessor. This is often prepared and filed along with the Affidavit of Death of Trustee and Report of Death of Property Owner. You will need to include a copy of the Trust with the reassessment exclusion form. Filing this particular return may be optional so consult with your CPA. The American Taxpayer Relief Act of 2012 made “permanent” the estate tax exclusion amount of $5,000,000, indexed for inflation. The indexed exclusion amount for 2017 is $5,490,000. This is the amount you can die with without an estate tax. Married couples can shelter almost $11 million combined. Under the new law, the surviving spouse can “port over” the deceased spouse's estate tax exclusion and double up his or her exclusion amount. For example, if husband dies in 2016, wife can port over any portion of his unused $5,490,000 exclusion and add it to her exclusion. When she dies, her family can exclude husband's $5,490,000 amount as well as the then indexed exclusion amount for her. However, to port over her husband's exclusion, she has to file a form 706 estate tax return for her husband and make the portability election. Unless she files form 706 and makes the election, she cannot port over the exclusion. Only spouses can make the portability election. If your surviving parent has a large estate, he or she should consider filing the estate tax return. You will need to file a final income tax return for your deceased parent. Once your mom or dad dies, his or her social security number can no longer be used to report income. Depending on the type of assets and how soon the assets are distributed to the beneficiaries, you may need to file a Form 1041 fiduciary tax return. The return will report the income earned on the Trust assets from the date of death until the date the assets are distributed. Many Settlors will leave a list with their Trust for the distribution of specified personal property. The successor trustee should deliver any such property as soon as reasonably possible and have the recipients sign a receipt for the items. Items not specifically noted for distribution may be equitably divided by the trustee among the beneficiaries, an estate sale can be held and the proceeds added to the Trust funds, or donated as appropriate. 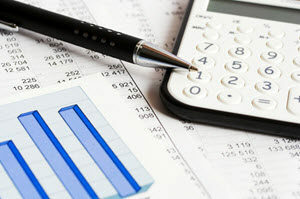 After you have paid off the liabilities of the Trust estate and liquidated the assets, you may be in a position to make a preliminary distribution to the beneficiaries. We always recommend you hold back enough funds to pay for unknown and unexpected future bills. If you distribute all the funds right away, it may be difficult to ask the beneficiaries to pay some of the money back when an unexpected bill or expense crops up. We typically recommend our trustee clients hold back a certain amount for six months to a year to cover unexpected expenses. Then when the dust settles and it is reasonable to believe there will not be any more expenses, you can make the final distributions. If there are assets not titled in the Trust, such as small bank accounts, those accounts can usually be transferred using a Small Estate Declaration under Probate Code Section 13100, so long as combined value of such accounts are worth less than $150,000. We highly recommend you get the beneficiaries to sign a receipt on each distribution. We also recommend you ask them to sign a waiver of further accounting. If the beneficiaries Trust you and you have demonstrated honesty and reliability in your handling of the Trust, they may not ask you to give them a full accounting. You should be able to give them a spreadsheet of the Trust accounting if requested, but by the time you make distributions, you should ask the beneficiaries to sign a waiver of further accounting. You don’t want them to scrutinize your accounting after they receive their distribution. If they want to examine the books, they should do so before the distributions so any issues can be resolved at that time. There can be other questions and issues that arise during the course of administration, such as what to do with inheritance reserved for a minor or a beneficiary who is under some form of public assistance such as Social Security Disability or Medicaid. You may even have a request to distribute a specific asset such a real property to a particular beneficiary as part of their overall share. Seeking professional advice on these types of questions is not a bad idea. This is not a complete list of tasks, but it covers most of the tasks a trustee will have to complete to administer a Trust. One of the most important and effective strategies for a successor trustee is to communicate regularly with the beneficiaries on the status of the Trust administration. Doing so generally results in greater Trust and patience from the beneficiaries as you methodically bring the Trust administration to completion. Have an AmeriEstate professional administer your trust. I didn’t realize that without a living trust we could be looking at 9-18 months to sort everything out. My dad is getting worse with his health and so he wants to get his things in order. I want to be sure that if we create a living trust, we pick the perfect attorney for the job. Thanks for the details to get us back on track to finish his living trust. Based on your comments, if your Dad is in declining health, pick an estate planning attorney that can prepare a proper estate plan that effectively deals with the potential incapacity of your dad, that both protects him, but also makes it easy for the family to step into the role of managing things for him if needed. Let us know if we can help. Thank you for the information. My husband’s aunt just died and he is the trustee in her irrevocable trust.